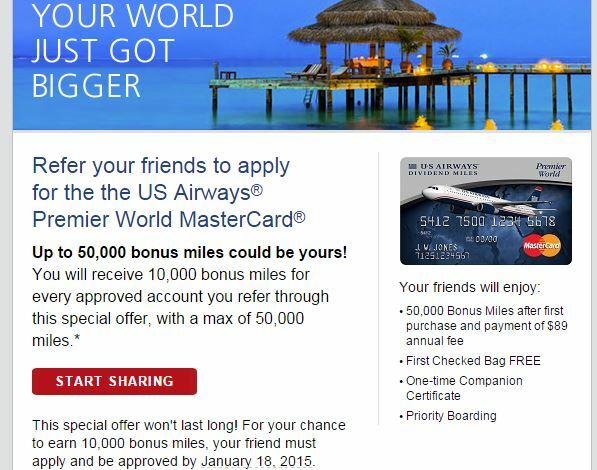 Refer a Friend Offer Now Available for the Barclays US Airways MasterCard with 50,000 Mile Bonus! Barclays is really going all out to acquire new cardholders before it can no longer issue the US Airways MasterCard as they have not only raised the signup bonus on the card to 50,000 miles and will give you $25 to switch to paperless statements but they are now allowing existing cardholders to refer others to the card for either a 5,000 mile or 10,000 mile bonus! I have never heard of a refer a friend program from Barclays before so this is great news for cardholders. This offer does appear targeted as I got a 10k refer a friend offer but a follower of mine only reported a 5k refer a friend offer. Check your email for your offer! 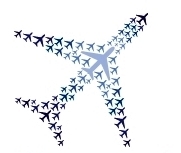 You will receive either 5,000 or 10,000 miles per every approved account up to 50,000 bonus miles. Your friend will receive the offer for 50,000 miles after first purchase. There is no 10,000 anniversary bonus on this offer. See this post for that link with the 50k + 10k offer which is meant for Preferred members but will work even if you don’t have Preferred status and are instantly approved. Your friend must apply and be approved by January 18th. This is the second best offer on the card now behind the 50k + 10k which is aimed at Preferred members. I recommend going for that offer before this one as the 10k anniversary bonus is worth it. However, I have heard reports that if Barclays does not automatically approve you and you have to call the reconsideration line, they may not approve you if they see you are in fact not a Preferred member. If you are risk-adverse, I recommend going just for this 50k offer since it is open to anyone and you can call reconsideration if not automatically approved and still have a good chance to get approved. Feel free to email me at ralph@pointscentric for a referral or leave a comment and I will send you an email. Again, only apply for this if you are not a Preferred member and are risk-adverse! Also I am giving away my 20% off award flights code on Southwest – click this post for details! Thanks for the heads up to my Twitter Follower @4321ka! I got this email for 10k points, but I can’t open it. Try opening in internet explorer.